When you purchase a new Rolls-Royce, your service and maintenance is taken care of for the first four years by our service package, regardless of how much mileage you’ve put on the car. To ensure that your car gets serviced promptly and more effectively, Condition Based Servicing is included with every new Rolls-Royce. Sensors monitor crucial parts and systems so services can be scheduled to meet the specific needs of your vehicle at the right time. Every new Rolls-Royce is covered by a four-year unlimited mileage warranty*, which gives coverage for practically every possible circumstance or occurrence. Wherever you are in the world, whatever happens, we’ll make it our priority to promptly and efficiently provide the necessary repairs your vehicle needs by a Rolls-Royce authorized workshop. *Excludes tyres and glass. Unlimited mileage does not apply to commercial users please consult your local dealership for more information. 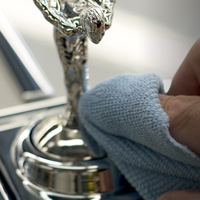 Our Rolls-Royce Motor Cars Orange County technicians have been trained by highly experienced and knowledgeable teams from Goodwood. The technicians at our dealership are fully equipped with the most cutting-edge diagnostic service equipment and have continuous training to keep them up-to-date on the latest automobile technology. Our Rolls-Royce Motor Cars Orange County in Newport Beach, California only use genuine Rolls-Royce parts and accessories to ensure the integrity of your vehicle. Designed with identical standards and particular specifications as the originals, any of our replacements will ensure your vehicle receives optimal performance like the day you first purchased it.